When YouTuber Josh Carrott, better known here as the Korean Englishman, appeared onstage with his creative partner Ollie Kendal, the crowd erupted into cheers. The two English nationals, famous for their video content that introduces Korean culture to foreigners, frolicked around onstage. They brought audience members into the spotlight, handed out snacks and hosted a 15-minute performance with showmanship. Magician Nicky followed with a live magic show, bringing audience members onto the stage. Online personalities are increasingly venturing off mobile and PC screens to interact with fans offline. 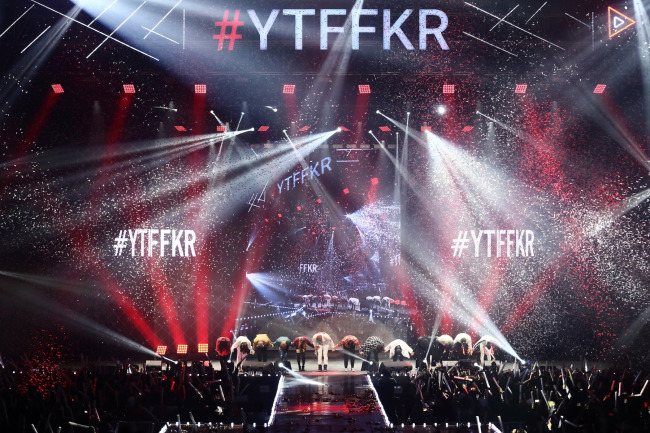 From aspiring young creators to influencers’ avid fans, an eclectic crowd of 3,000 fans filled the Olympic Hall at Seoul’s Olympic Park on Sunday evening for the fourth annual YouTube Fan Fest. “The YouTube community is growing. We wanted to create an opportunity where creators and fans could meet in one place,” said Google Korea’s Country Marketing Manager Kay Shin. A roster of popular YouTubers including beauty creator Ssin, guitarist Jung Sung-ha, cover musician Bubble Dia and game content creator Great Library graced the stage with live shows. Fans waved neon light sticks in the air, cheering for the online personalities as if at a K-pop concert. Middle schooler Kim Se-joon, who hopes to become a YouTube creator in the future, said the show was a learning experience for him. “I want to create my own entertaining content in the future. I’m glad I got to see my idols in person,” said Kim, adding that his favorite creator is Great Library. At the Fan Fest Kids’ Festival, which took place Saturday, creators of content targeted toward children interacted with their young followers. Some 4,000 people attended the event, which took place at the SK Olympic Handball Gymnasium. The festival was the first offline daylong event catering exclusively to younger viewers, YouTube said in a statement. Present at the festival were creators such as animator Dotty and Let’s Play Yura, who uploads play sessions with toys. Children met and played with their favorite online personalities in person at individual booths set up in the venue. YouTube Kids, which offers content for children to 37 countries in eight languages, was launched in Korea last May.